Bearing failures are among the highest root causes of failure in triple offset valves (TOV) for tight shutoff applications. This issue is directly attributed to the need to have metal bearings with very tight tolerances when accepting the shaft diameter. Properly designed TOV’s are metal to metal torque seated type valves. Therefore, very little shaft deflection can be tolerated in order to torque the seal ring into the seat. Additionally, properly designed TOV’s should have the bearings located as close as possible to the centre line of the disc, which helps to deliver rigid support of the shaft on sealing. In oil and gas and petrochemical applications, there are many potential problems associated with bearing failures. Many of these are obvious, such as sulphur tail gas and acid gas services within refineries and gas processing plants. Sulphur in the gas state will have a phase change to a solid at temperatures below 115°C. If the gas phase sulphur is trapped in the bearing cavities and there is a drop in the temperature, the sulphur will become a solid. This causes bearing to shaft seizure, locking the disc in one position. When this situation occurs, the end user must apply a heat gun of some sort in order to unlock the valve. This procedure is not the best practice when operating a modern process facility. 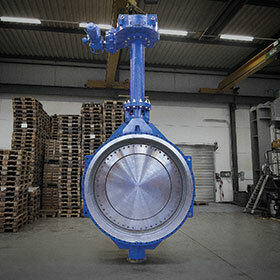 Most TOV valve manufacturers offer a welded on steam jacket in order to deliver heat to the bearing area. While this is good design practice, human error can negate this benefit if plant personnel turn off the steam to the jacket, or unhook the connections to perform maintenance and then do not reconnect the steam to the fittings. Other chemical applications such as butadiene and styrene have the same issues as described above, except when these chemicals become trapped and dormant it causes a phase change and popcorn, or polymerisation, resulting in seizing of the bearings. Additional situations are also attributable to fouling, such as simple pipe scale. Furthermore, during the start-up phase in new constructions when the pipes have not been properly flushed, debris can migrate into the bearing cavities. Improper designs can also add to bearing failures once in service. If a certain design has not taken into account the thermal coefficients of both bearing material and the tolerances accompanied by the cross sectional thickness, then the bearing could lockup during fast changing thermal conditions. TOV valve manufacturers are keenly aware of these potential problems and in the early ‘90s some manufacturers introduced the bearing protection ring, which has now become the industry standard. However, this feature has proven fallable. A single ring of die-form graphoil installed into a groove in the ID of the bearing without a compressive load will flatten out and quickly become ineffective, even after only a small amount of cycles under pressure – graphoil has no memory. Other manufacturers offer a dual packing set with a lantern ring sandwiched between them, in addition to a flush port with grease fitting located on the bonnet to allow for flushing of the bearings. Some even offer O-rings at the bottom of the bearing cavity. This design would be a good solution, but in the petrochemical market Fire-Safe designs are mandatory, and an O-ring in the bearing cavity would not be considered compliant. German-based Zwick, the manufacturer of the Tri-Con series, is particularly strong in special applications requiring several customised features. An example of this is a mechanical design which ensures that both the ID and OD of the bearings are protected without violating the Fire-Safe criteria. The design incorporates three rings of die-form graphoil packing at the very end of the bearing ID, and then three rings of the same on the OD, both are captured by machined edges and loaded by the packing, which keeps the graphoil rings from flattening out. This patented design is called the sealed bearing feature. Besides the fact that it prevents any media from entering the bearing cavity, the advantage of minimal shaft deflection is preserved by this special design, which also functions as an additional packing seal to keep fugitive emissions to a minimum.